That question is nails down the chalkboard for harried parents. But imagine that query from the lips of Wall Street’s talking heads, pundits and investment experts. Recently they’ve all pointed at their favorite indicator, economic report or line on a chart as the demarcation for what was or will be the top for this bull market run. But in the race to be the first — or maybe just the loudest — there’s one overlooked little indicator that tagged a high not seen since 2001. Yes, that’s back to the late days of the dot-com bubble, when the economy experienced years of amazing growth. And it shows where we are in this long run higher. When an economy is humming along at a solid clip and we are confident that growth will continue, we take more risks. That includes quitting our jobs for better opportunities such as higher wages and improved benefits. In May, the percentage of people within the private sector who quit their jobs jumped to 2.7% from April’s reading of 2.5%. That’s the highest level since 2001. The rate at which people quit their jobs across all workers also climbed in May to 2.4% from 2.3% — another high not seen since 2001. 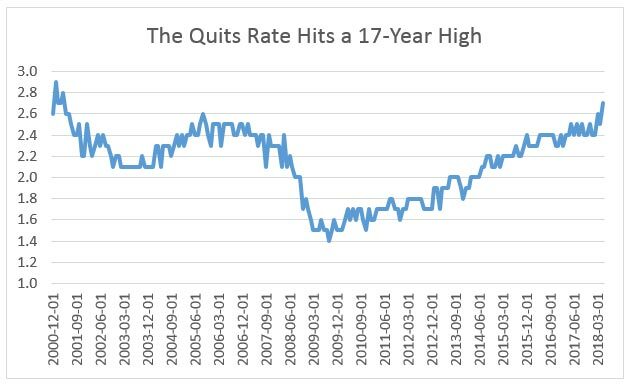 While the quits rate has steadily risen from extremely low levels reached in 2009, workers have largely been hesitant to quit their jobs. At first, a shortage of jobs was to blame. And then it shifted to a lack of improvement in terms of higher wages. In fact, many people have stayed at jobs far longer than average because of a lack of opportunities. The average worker between the ages of 25 and 34 stays at a job approximately 2.8 years. However, a Pew survey revealed that 22% of millennials in 2016 had been with an employer at least five years. That’s double the average. Employees have gotten gutsy again. A heathier job market is to thank for it. Over the past year, we’ve seen a steady rise in hiring and job openings. In fact, the number of job openings hit an all-time in April of 6.7 million, outnumbering the number of people actually looking for work. Not surprisingly, the unemployment rate ticked higher in June as more people returned to the job market. The only thing that has been missing from this puzzle is wage growth. June average hourly earnings climbed by 2.7% on a year-over-year basis. That’s short of the expectations for growth of 2.8%. Employers will be forced to raise wages to keep and find new talent as the job market gets tighter and people start quitting their jobs for better opportunities. While higher wages will lead to inflation worries and the Federal Reserve increasing interest rates, we still have time before the Fed raises rates high enough to put a serious crimp on economic growth and stocks. Don’t run from this market yet. We’ve still got some room to grow as job seekers grab higher wages. The Fed won’t be putting an end to this party until at least 2019 at the earliest.